just finished my first day of school (holla at the quarter system) and it’s been a doozy. for the first time in forever (i’m not sorry), the majority of my classes aren’t subject-based (meaning that i’m in accounting, and have no more calculus classes to die in). feeling a bit nostalgic over how high school was about ap tests and college apps, compared to the big kid classes and need to find internships of today. and in that vein, meet the mediterranean quinoa salad. it was a high school staple for when i was on dinner duty (i had this aversion to actually cooking things, and tried to stick to as much prep as possible). note that this isn’t a recipe. there’s a time and a place for one: cake, cornbread, cream puffs, all other desserts. it’s nice when you don’t want to have to think, and you just follow the recipe like a robot. but not having to measure is liberating. sure, you could find a recipe for a quinoa salad or a stirfry. personally, i find it annoying to have to measure out things, especially when it’s most likely that the author of said recipe has a different palette than i do. i tend to like things moderately salted, but heavy on the vinegar and garlic (it might be inevitable that garlic will start leaking out of my pores). 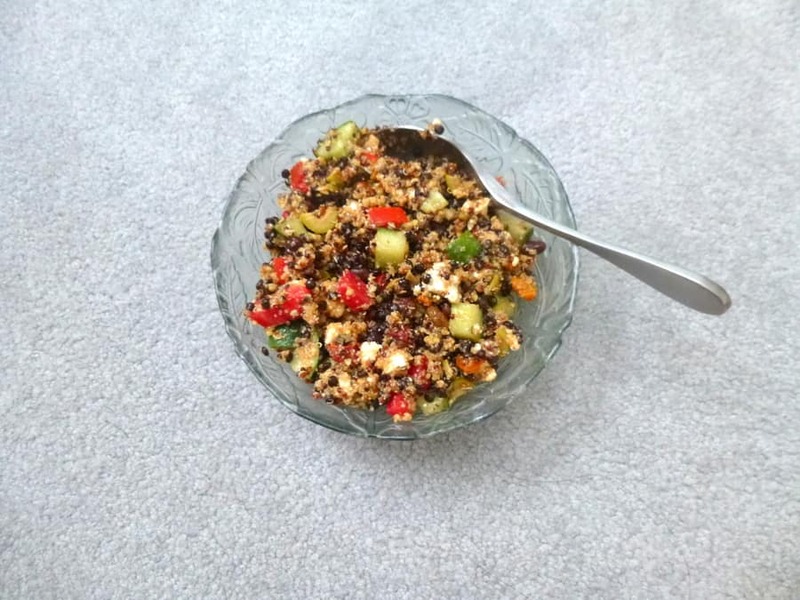 first things first for making mediterranean quinoa salad: cook your quinoa. sometimes i do quinoa, sometimes a quinoa/amaranth/millet combo. let it cool, or don’t. i have a theory that the warm grains soak up the dressing better, but i have no solid data measuring the before and after grain weight. sorry. then the dressing. extra virgin olive oil, mustard (i like dijon), vinegar (i like sherry vinegar because i think it’s more potent than balsamic, but either works), dried herbs (i usually go with basil, oregano, thyme and maybe dill), minced garlic (i do 2 raw cloves, but i’d suggest 1 for the average person) and salt is the base. you can add onion, fresh herbs or lemon if you want more freshness in the dressing. a couple handfuls of dried cranberries or raisins go in for some sweetness. and if they go in now, they can plump up a bit rather than staying shriveled and sad. the bulk of my mediterranean quinoa salads tend to be veggies. this time i stuck with tomatoes and cucs (cucs or cukes? i write cucs but still pronounce it as cukes even though if you just see cucs that could sound like cooks or cucks or not cucumbers). go ahead with the bell peppers, lettuce, carrots, celery, corn, peas, whatever. prepared/cooked/not raw things are something else to think about: sundried tomatoes, pickles (particularly giardiniera; not going to judge if you add pickled ginger or dill pickles, though), steamed beets, blanched green beans/broccoli. i promise it’ll taste good. all guarantees nullified if you don’t like that veggie already. i like adding protein. my go-to is canned beans, though obviously lentils, tofu, chicken, steak, shrimp, pork, none of the above, etc etc all work, too. toppings. for lack of a better term. cheese is important to me, so in goes crumbled greek feta. shaved parm sounds good to me, as well as sharp cheddar and gruyere and fontina (i like my cheeses flavorful; if mozzarella or swiss or havarti sounds good to you, go for it). and plenty of roughly chopped spanish manzanilla olives. i also like kalamata; none works too for all the people who don’t like olives (i know there’s plenty of you out there). sometimes i like adding toasted seeds/nuts for crunch. and my mom loves adding sliced avocado on top. i reiterate: do what you want. add what you want, or what you have. i feel like my versions tend to have a mediterranean vibe with plenty of herbs and evoo and feta and olives, but yang loves doing a southwestern kind with cumin and corn and bell pepper, and i’ve seen a ton of asian inspired ones with sesame oil and edamame and seaweed.